We dropped new greeting cards into the shop overnight, so go take a peek. Use code GETSOCIAL at checkout to get 35% off these new cards. There's still time to grab our Laser Cut Skull greeting card for halloween! It's always nice to say thank you and it's even better with custom note cards! We had a blast printing special thank you cards for Carrot Creative, a brooklyn based creative agency. We mixed things up and foil stamped 2 variations, one in silver foil on green stock and the other in two color foil (orange + green metallic) on white stock. When was the last time you sent a handwritten note? We wanted to showcase this set of cards we printed recently to demonstrate the difference between embossing and debossing. The artwork for both were identical, the only difference was how they were printed. 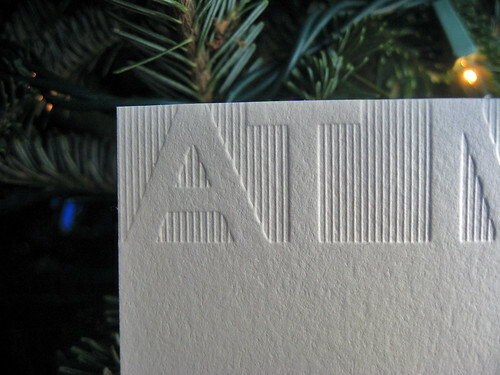 Embossing (top) is when the image is raised on the paper - think certificate or diploma. This is done with a die + counter and is done without ink or registered to foil. We use metal plates which are slightly more expensive but hold finer detail. 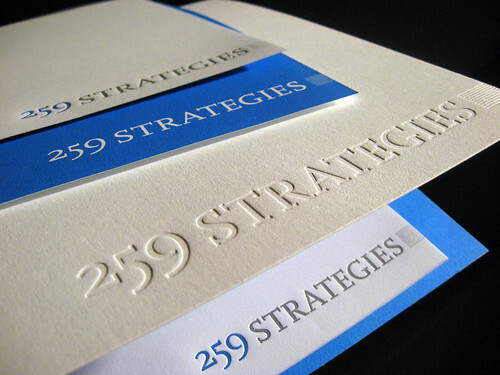 Debossing (bottom) is the effect that occurs with deep impression letterpress. The image or design is pressed into the paper and can be done with or without ink (blind). 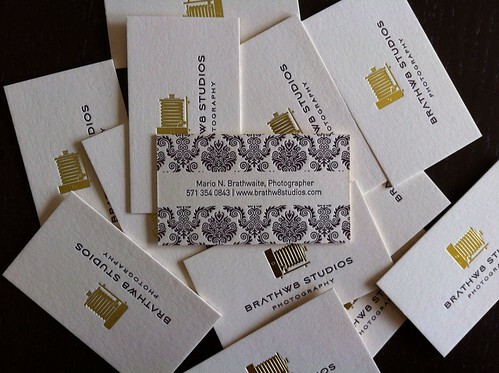 We print letterpress designs with photopolymer plates. The details: Stock was 220# Lettra, designed by Danah Nassief Design, blind printed (no ink), edge colored in purple, and a custom purple envelope. Check out all of the photos in the full post including some instagrams of embossing with a registered foil. Just added to our work portfolio, a custom invitation we designed for Erin's sweet 16. The invite was a great mix of fun and sophistication with a classic layout that we tuned up with elements of purple. We added a custom liner to match the invite with the same bowtie theme. 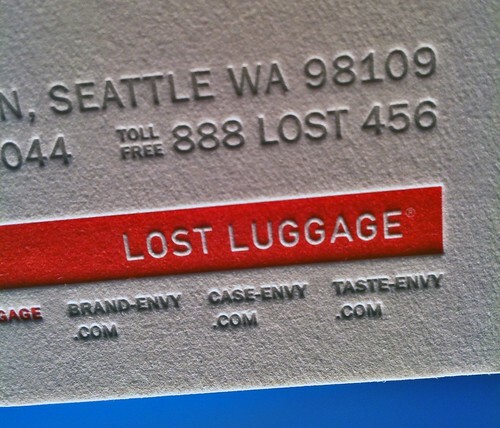 Say Lost Luggage letterpress three times fast, that's a tongue twister! Here's some stationery we recently printed for Lost Luggage, a company that designs and manufactures high-end binders, accessories, and presentation materials. Both pieces were printed in two colors, warm gray and red. The letterhead was printed on 32lb cotton stock (finished size: 8.5" x 11") and the notecards on 220lb (600gsm) lettra (finished size: 9 1/8" x 4 1/8"). We have always had an affinity for the chartreuse and pool colors from Paper Source so when we saw that they combined those colors to create some really cool patterns, we couldn’t resist designing some personalized note cards around them. 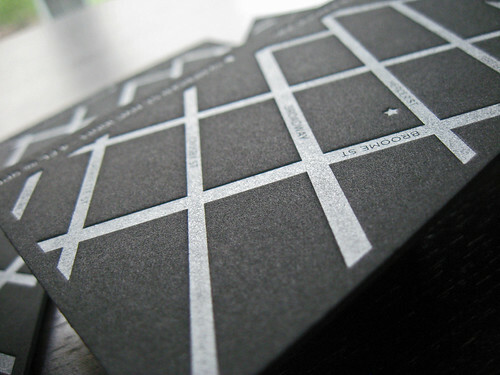 The letterpress stationery set includes an A2 folded card and two different lined envelopes. Email us (or post below) a picture of your favorite patterned pattern and see what we can create for you. 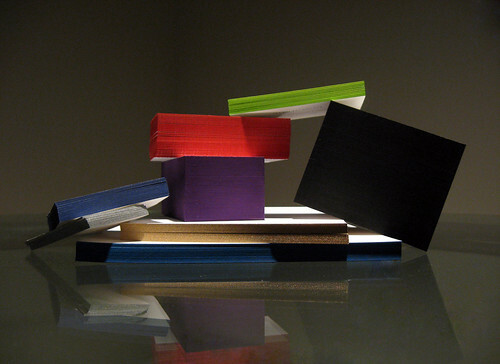 We wanted to share a few snapshots of a variety of edge colored cards from business cards to stationery and wedding invitations. 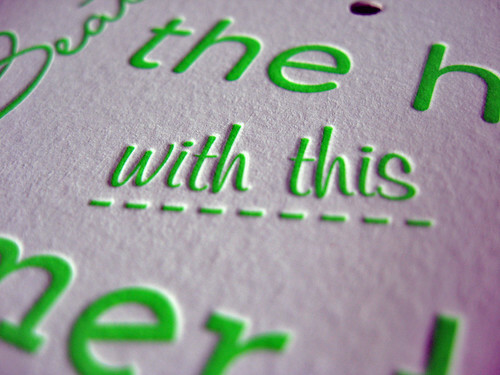 We think its a great way to add a touch of color to your letterpress project. Almost any color can be painted on the edge of your cards from light pastels to bright neons and even dark colors like purple and black. 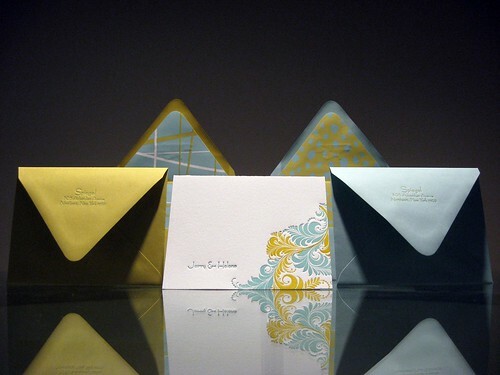 Metallic colors can also be painted on the edges like the silver and gold metallic cards shown below. 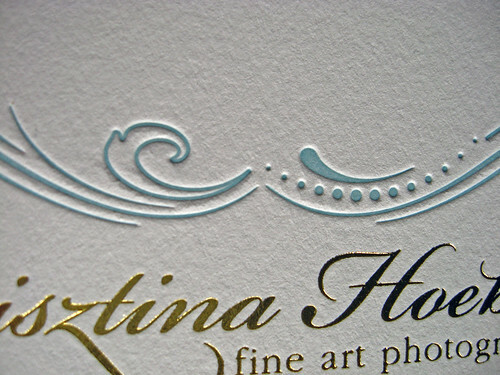 We can even match the edge color to the colors printed on your cards or stationery. Letterpress printing isn’t just for business cards and wedding invitations although you might think that if you look at our recent posts. All joking aside, while a lot of people use letterpress business cards, we’ve noticed a growing trend, letterpress promotional material. We work with and print for a lot of creative people, but when it comes down to promoting your own work, businesses want something that will stand out. 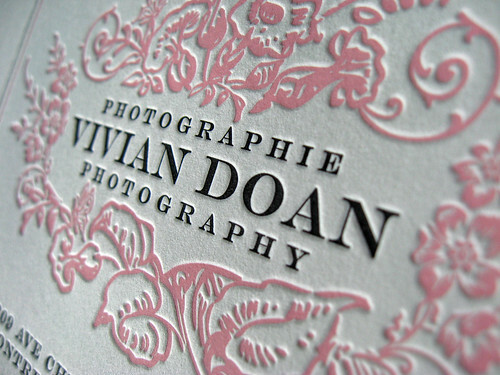 These CD covers for Vivian Doan are a great example of how to tie in letterpress with your promotional goods. We had some fun with type and ink printing these custom tags for a gift basket. Our friends at Bella Flora we’re giving out gift baskets this summer and needed tags for them. That’s where we came in, we worked with Jaime to design them and bring in fun elements through the use of type, styles, ink and the backing paper. Check out the photos of the tags and basket after the jump.